8:00-9:00am Meet our tour guide & driver at Tianjin Cruise Port early in the morning. Drive to Beijing city and visit Tiananmen Square which is the largest city center square in the world, then head for the imperial palace for twenty-four emperors during the Ming and Qing dynasties– Forbidden City. Transfer to the hotel after the tour. Visit the traditional Chinese handicraft factories for free of charge will be arranged for today. Pick you up from hotel early in the morning by our tour guide & driver. Then visit Temple of Heaven, a masterpiece of the Chinese people created in ancient times. People do a lot of activities at Temple of Heaven especially in the morning, you can see many people dancing, doing Tai Chi and so on. Afterwards, going to Mutianyu Great Wall is a good choice. 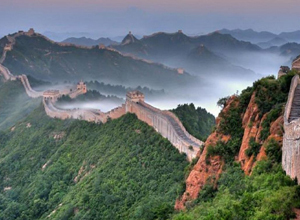 It is one of the most famous and best-preserved parts of the Great Wall. We will enjoy the wall by round trip cable car. A traditional Chinese handicraft factory visiting will be arranged for today. Return to Tianjin Port after the tour.